Add to My Favorite Store. 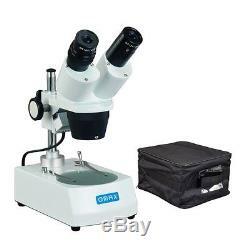 OMAX 20X-40X-80X Student Binocular Stereo Microscope with Dual Lights and Vinyl Carrying Case. This is a stereo binocular microscope with binocular viewing head and a vinyl carrying bag. The microscopy has 20X, 40X and 80X three step magnifications with dual tungsten lights from both top and bottom. The microscope takes 110V power input. There are many accessories such as USB cameras, darkfield stages, tweezer clips, which can be attached to the microscope to make it more powerful. Three magnification levels: 20X, 40X and 80X. 45°inclined binocular head on metal stand and framework. Adjustable focus knob tension and inter-pupillary distance. Dual lights: incident and transmitted, diopter adjustment on left ocular-tube. Includes light weight vinyl carrying case. Total magnification: 20X, 40X, 80X. Eyepieces: wide field WF10X/20, WF20X. Objectives: rotational 2X & 4X. Left ocular-tube diopter adjustment ±5dp. Interpupillary distance: 2-3/16" 2-15/16"(55-75mm). Light weight vinyl carrying case included. Power supply: 110V (US and Canada). Dimension of microscope: 9" x 4-3/4" x 12 (23cm x 12cm x 30.5cm). Dimension of vinyl case: 10-1/4" x 6-1/4" x 11 (26cm x 16cm x 28cm). A pair of WF10X eyepieces. A pair of WF20X eyepieces. Frosted glass objective stage plate. Wrench for focus knob tension adjustment. Allen key for stage lock. A: We are happy to leave feedback for our customers once we have been paid and the item has been delivered to the carrier. We are here to exceed your expectations! The item "OMAX 20X-40X-80X Student Binocular Stereo Microscope w Lights, Carrying Case" is in sale since Wednesday, April 06, 2016.